I betcha there are five “wetbacks” hiding in that foldup camper on the way to sanctuary in Arizona. 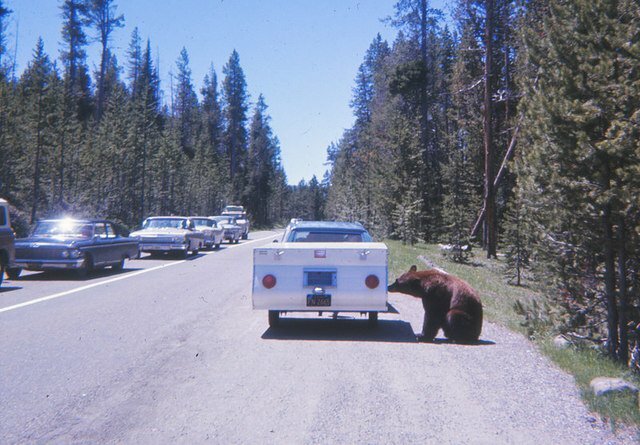 That bear probably sniffed them out as a tasty meal. Maybe the solution might be to feed children on foodstamps to the bears? Just trying to think like an Okie here. So the Americans have to choose between people like these and people like Hillary and Obama. Meanwhile us Russians have to choose between Putin and people promoted by the very same characters Americans have to choose from. Well, God apologized too. For creating a state sized filthy cesspool named Oklahoma. That wasn’t his intention either. At least the inhabitants know where they belong. Ya know..you’d think these GOP dumb fucks would get tired of looking like the posterchild for Morons-R-Us. But nuuuuuuu. Un uh. They have to double down on idiocy. As if Trump weren’t enough to make a laughing stock of the GOP, along comes this clown. Let’s just hope he chokes on his words.